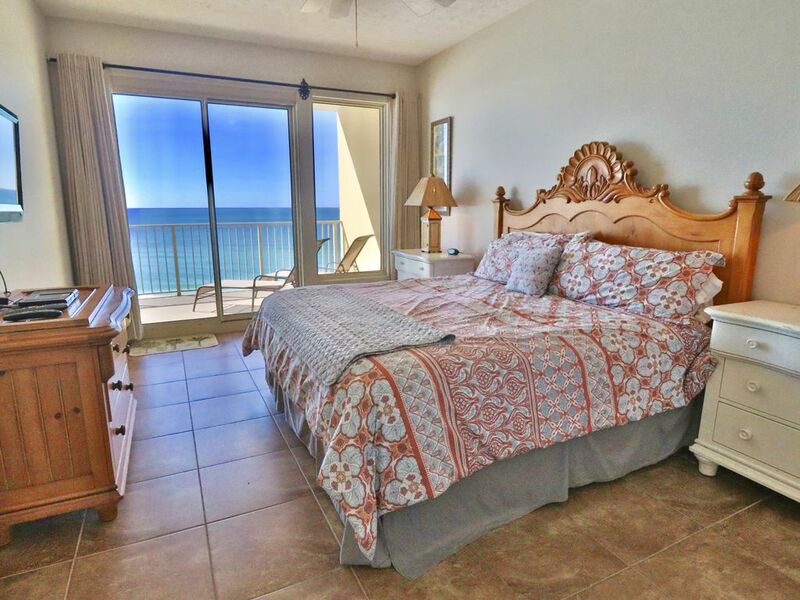 A complete resort condominium located on the emerald-green waters of the Gulf of Mexico and are totally Gulf-front condos with all the bells and whistles. Enjoy many on-site amenities:, tiki pool bar, hot tubs kiddie pool, and a full-service beach with jet-skiing,beach chairs/umbrella complimentary for your stay in some condos... para-sailing, and sailing. This unit has all the upgrades. Nice and clean! This unit includes a stack-able washer/dryer for your convenience-- sleeps up 8 people. The master bedroom has a king size bed and balcony access with a spectacualr view of the ocean. It has its own bathroom with dual vanities. It has cable tv. The 2nd bedroom has a queen size bed and cable tv. The living room has a large flat screen tv hanging on the wall. There are 2 bunks in an out of the way area behind the kitchen table. They have twin size beds and are big enough for an adult. A full kitchen to prepare those fun meals when you not out dining at the many outstanding restaurants located within walking distance or a short drive to the Gulf Crest. Twenty-four-hour, security, guard gate for your protection. The condo was very nice overall. The master suite was very spacious; however, the bed frame was very squeaky and the bathroom could use some updating. The floors were also not cleaned sufficiently prior to our arrival. Every time we walked around barefoot our feet would be black on the bottom. I loved the outdoor patio space and all of the amenities are incredible. You are a minutes walk from restaurants right outside the property and there&#x2019;s even a yummy grill by the pool that serves fresh food and drinks. Highly recommend for families, friend groups, or couples! Loved my stay! We had a great stay at this condo while on vacation. The view of the beach from the balcony was amazing! The unit was very clean upon arrival and had everything we needed. Close to restaurants, attractions and shopping. There was not a long wait for elevators and the assigned parking was a big plus. The only few negative things we found with this unit was the patio furniture is getting worn, as well as the bathroom fixtures (looks like the brass plating is flaking off). Would definitely recommend and would stay in this unit again in the future. Great condo in a great location, nice pools and poolside tiki bar would rent again. The condo was nice...the balcony was amazing and having the beach chairs included was such a big help not having to drag chairs down there. The condo needed a deep cleaning but had everything furnished. Will stay here again. Condo is great with huge balcony. Building is in great condition with two pools and hotubs. Included chairs and umbrella was a nice addition. It was a great home away from home! It did have faucets that dripped the whole time while there. The overall experience was Great!! Would revisit!!! The view is amazing!!! WATER PARK, SAINT ANDREWS STATEPARK,RIPLEYS BELIEVE IT OR NOT,WALMART, WALLGREENS, MANY GREAT RESTURANTS. CLUB LA VELA, SPINNAKER, AND HAMMERHEAD FRED'S ARE ALL WITHIN WALKING DISTANCE.